Guess we all are gifted in some way or the other – but in this daunting journey of life, some continue to hold on to their craft close to their hearts while others lose their way & settle down by choosing the safe path. 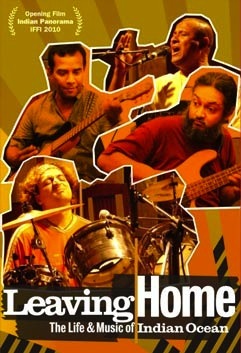 Leaving Home: The Life & Music of Indian Ocean tells us a story of 4 guys with a common thread – deep rooted passion for music. Music that’s intricately woven with rustic sounds & honest intentions. The best part about the ‘band’ Indian Ocean is that they are unlike a rock band – they are probably travelers in time with a common destination – reaching out to as many with their soulful music. It’s hard to classify them in a particular genre as they keep reinventing their own language (a delightful surprise every time they give birth to a new track through their jamming sessions). Yet I can dare to call Indian Ocean as the only, truly free spirited Indian Rock Band, with a blend of earthy compositions & rustic melody. Their music often speaks of issues that surround the political & social milieu of our country through hard hitting lyrics & equally intense sound. Sushmit, Aseem, Rahul & Amit have been instrumental in scripting a golden period in Indian Music – standing tall through the various daunting challenges, test of time, losing friends & eventually discovering themselves through their unique & original music. Jaideep Varma has created something special through this documentary – a beautiful essay, a passionate portrait, of struggle against all odds, friends who just wanted to make music straight from the heart and rooted to the soul. A warm & inspiring tale of a leaderless band & music that takes you on a journey of self discovery. A tribute of sorts, a milestone rockumentary & first of its kind! As you come the end of the film, you feel ‘wish this rock show would never end’. With the untimely death of the versatile Aseem, I wonder if Indian Ocean will ever sound the same again… Yet believing that this band has crossed many adversities in the past & hoping that their music will find another Aseem in their journey. Hope they continue making music, redefining sounds, recreating magic & breaking boundaries with their soul-stirring rhythms.